This text provides foundational information relating to the field of gifted education (i.e. history, laws, etc. ), details characteristics of gifted students from various populations, describes how such students are identifiedand assessed, and presents up-to-date, research-based pedagogy relating to curriculum design and instruction. It draws upon experts in the field to present content in a practical way so that it is applicable to pre-service and classroom teachers. Chapter summaries and questions for thought and reflection are included at the end of each chapter to help guide classroom discussion. In addition, each chapter provides a listing of useful resources that enables the reader to extend their learning on a particular topic or issue. 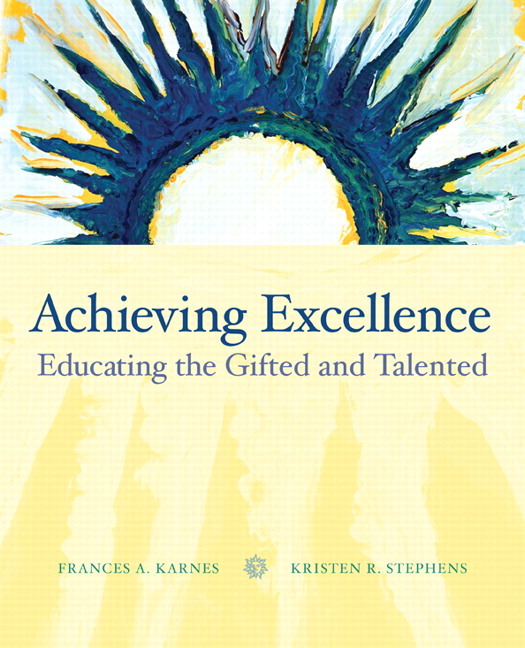 Combines 3 critical issues relating to the education of gifted students: Characteristics, Instructional Practices, and Curriculum--text can be used across the three major courses in the field. Draws upon experts in the field to present key, up-to-date content--readers obtain the most recent information from the relevant and knowledgeable sources. Chapter summaries and questions for thought and reflection are included at the end of each chapter--helps facilitate and guide classroom discussion. Provides a listing of useful resources at the end of each chapter--allows readers to extend their learning on topics of interest.